Cape Reinga projects from the north-western end of the Aopouri Peninsula at the very top end of New Zealand. 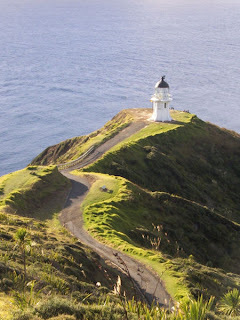 A lone lighthouse stands at the summit of the cape (image at left from Wikimedia), and a venerable pohutukawa tree hanging over the cliffs is pointed out as the very tree from which, in Maori tradition, the spirits of the dead clambered down to the ocean on their way back to Hawaiiki, the mysterious land that was the ancestral point of origin of the Maori to which they returned after their death*. Cape Reinga is a popular tourist spot as the northernmost point in New Zealand. It isn't. If you look carefully at the map at the top of this post (from the Far North District Council), you'll note that at the north-eastern corner of the country, there's a rounded prominence sticking further north. This is the North Cape, and that rounded prominence is the Surville Cliffs. *There is an unfortunate tendency to refer to 'Maori tradition' as a single unit, when prior to European settlement the different Maori tribes each had their own collection of traditions, agreeing in some points and differing in others. While the concept of a return to Hawaiiki was, I believe, universal among Maori, I haven't been able to find out if this tradition was associated particularly with Cape Reinga for all Maori, or if tribes in other parts of the country identified their own departure points. Apparently more than one Christian missionary, including the memorable William Colenso, tried to have the Cape Reinga pohutukawa chopped down, but these attempts were always rebuffed by local Maori. So why aren't the tourists all headed for the true northern tip of the country? The Surville Cliffs are part of a conservation reserve (the North Cape Scientific Reserve) that remains closed to the general public. The local Department of Conservation attempts to ruthlessly exclude and/or eradicate introduced taxa from the area, and the primary focus of this protection is a small area of about 120 hectares on the Surville Cliffs and the adjacent plateau that is home to a whole range of plant species found nowhere else on the planet, including Hebe brevifolia (Cheeseman) de Lange 1997, Carex ophiolitica de Lange & Heenan 1997 and Uncinia perplexa Heenan & de Lange, 2001. 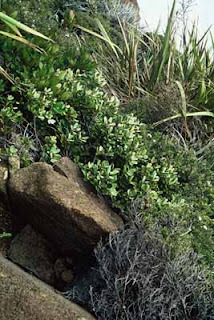 Pittosporum serpentinum, an endangered species endemic to the Surville Cliffs area. Seedlings of this species have never yet been observed (photo by Gillian Crowcroft, from New Zealand Plant Conservation Network). The range of plant species growing in any location is strongly dependent on the soil type. The effect of a change in soil type can be dramatic - sometimes you can practically see a line where one soil abruptly gives way to another. 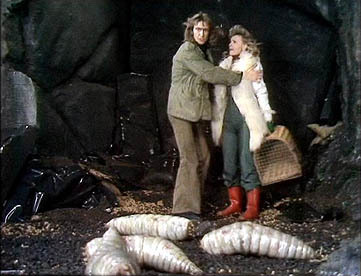 In the case of the Surville Cliffs, the presence of a distinct soil type not found elsewhere in New Zealand is to blame for the unique flora. The soil at the Surville is serpentine, derived from the exposure of the Tangihua or Northland Ophiolite. Ophiolite forms when part of the sea-floor crust becomes uplifted and integrated into the continental crust. Major ophiolite belts are found in the Alps and the Himalayas where pieces of the oceanic floor between two colliding continental masses have been ripped up and wedged between the fusing continents. In the case of the Tangihua Ophiolite, the rocks that eventually became the ophiolite probably formed in the South Fiji Basin to the north-east of New Zealand (Whattam et al., 2004). They would have then become emplaced onto the New Zealand continental mass with the formation of a subduction zone along the north-east of New Zealand, probably due to the collision of the underwater Hikurangi Plateau with the New Zealand continental shelf further south. Sketch map showing the disposition of tectonic elements adjacent to Northland. A, Immediately prior to the emplacement of the Northland Ophiolite. B, Immediately after emplacement and as subduction began. SFB, South Fiji Basin; VMFZ, Vening Meinesz Fracture Zone; HP, Hikurangi Plateau. From Whattam et al., 2004. Ophiolite is very ultramafic rock, meaning it is high in heavy metals such as nickel, iron and magnesium. Soils formed from such rocks are toxic to the majority of plants, which is why they become the preserve of ultramafic specialists. In contrast, most ultramafic specialists do not do well when grown away from their toxic homes (de Lange, 1997; Heenan & de Lange, 2001), which is why the Surville Cliffs flora is so restricted in distribution. The greatest threat to the Surville Cliffs flora is probably invasion by introduced taxa such as Hakea and Cortaderia (pampas grass), though eradication programmes are currently underway to try and reduce the risk from these invaders. Some members of the Surville Cliffs fauna, such as Hebe brevifolia, are present in large numbers and are probably not under immediate threat despite their highly restricted distribution. Others, such as Uncinia perplexa, appear to have always existed in very low numbers, and are seriously endangered. de Lange, P. J. 1997. Hebe brevifolia (Scrophulariaceae) - an ultramafic endemic of the Surville Cliffs, North Cape, New Zealand. 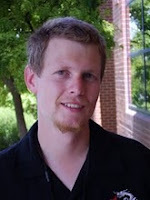 New Zealand Journal of Botany 35: 1-8.
de Lange, P. J., & P. B. Heenan. 1997. Carex ophiolithica (Cyperaceae): a new ultramafic endemic from the Surville Cliffs, North Cape, New Zealand. New Zealand Journal of Botany 35: 429-436. Heenan, P. B., & P. J. de Lange. 2001. A new, dodecaploid species of Uncinia (Cyperaceae) from ultramafic rocks, Surville Cliffs, Northland, New Zealand. New Zealand Journal of Botany 39: 373-380. Whattam, S. A., J. G. Malpas, J. R. Ali, I. E. M. Smith & C.-H. Lo. 2004. Origin of the Northland Ophiolite, northern New Zealand: discussion of new data and reassessment of the model. New Zealand Journal of Geology and Geophysics 47: 383-389.